So as promised my favorite recipe that we served on Super Bowl Sunday had to be my Seven layer bean dip. This is a great recipe for a quick and easy appetizer that will WOW!!! your friends and neighbors. Spread very thin and make one thin layer of beans. Using back of spoon to spread thinly. Until it looks like this; again put 16 dollops of the sour cream taco seasoning mixture. Spread again very thinly to cover all beans, using the back of the spoon. We are sharing so many more awesome Super Bowl Recipes from our Sunday Supper Contributors. 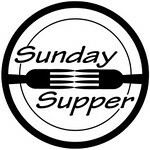 Please make sure you check out all of the other Super Bowl #SundaySupper participants to see what they’re bringing to the big game! Never made a bean dip before. Looks like fun to make! This is a gorgeous looking 7 layers bean dip! :) I'm sure the game day was more fun because of it! my mom used to make a version of this dip when we were kids...as a teen, my bestie tried to duplicate it, but popped it in the oven to melt the cheese. we laughed at her, but it actually was pretty good! i love recipes like these where we can each put our own little stamp on it. your rendition looks simply fabulous--i am sure it is the reason the packers took the championship :)--thank you for sharing with tuesday night supper club! I love this dip...I make something similar, but with avocado or guac instead of olives! This is so good with tortilla chips!! I'm sure it's a huge hit wherever you take it!! Looks so good, my recipe is a bit different too, I also do a guacamole layer but for those that don't like guacamole your is another option. I can make two, thanks so much. Look forward to making and trying. Your recipes just totally rock. I am loving the Cookie Crisp and Rice Krispie Treats! Thanks for rocking my comments this week! Check it out at Friendly Friday! Easy and delicious... Love it! I love this dish! Perfect for the big day!! It's the only way I like my refried beans!! Yum! Seven layer dip is always a favorite for me when I go to parties! Oh looks like I have one more thing to add to my menu for today! Perfect for the big game today!! I love dips like that!! Just give me a bag of chips and get out of my way so I can get to this dip. So good and such a classic game day dip. Such a classic party dip. I love how fabulous yours looks. Bean dip is the perfect party food! This is a dip I can get behind! Who can say no to 7 layer dip and I like the dish you chose to layer it in! Gotta love a classic and delicious gluten free 7 layer dip! My sister used to make this all the time, but she called it a walking taco. One of my faves! Yes...I would eat this up in a heartbeat. Love the border of tomatoes and olives...so pretty! I love 7 layer dip. I haven't made it in years though. Seven layers dip .... delicious. I love it.